The handful of Royal Navy personnel involved in Minewarfare, Diving and Explosive Ordnance Disposal (EOD - more familiarly known as Bomb & Mine Disposal) during Operation CORPORATE, the Falkland Islands campaign in 1982, and its aftermath, was awarded a total of one Distinguished Service Order (DSO), three Distinguished Service Crosses (DSCs), one Distinguished Service Medal (DSM), one Queen's Gallantry Medal (QGM), one British Empire Medal (BEM), six Mentions in Despatches (MIDs) and at least seven Commander-in-Chief’s Commendations for Brave Conduct. One Minewarfare & Clearance Diving Officer (MCDO) was appointed an Officer of the British Empire (OBE) and three MCDOs were appointed Members of the British Empire (MBE) for their achievements. 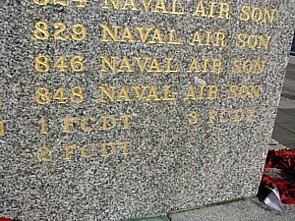 It is therefore surprising that the list of participating units on the Falklands Memorial outside Port Stanley fails to mention either of the two main Portsmouth-based Fleet Clearance Diving Teams (FCDTs 1 and 3 but up to five FCDTs were active) although it does include the Army’s field postal unit and the RAF’s mobile meteorological unit. 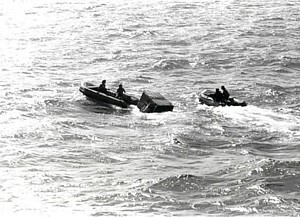 Of further note, Sir Lawrence Freedman’s Official History of the Falklands Campaign says little about the activities of the Fleet Clearance Diving Teams or the minesweeping trawlers of the specially formed 11th Mine Countermeasures (MCM) Squadron that swept 10 of the 21 deadly moored mines laid by the Argentinians in the approaches to Port Stanley; the other mines had either broken adrift and floated away or failed to deploy properly. I have brought these omissions to Sir Lawrence's attention in the hope that he will set the record straight sometime in the future. When the Task Force was being prepared it was realised that, in the event of hostilities, clearance divers would be required to conduct Explosive Ordnance Disposal (EOD), Battle Damage Assessment (BDA), Battle Damage Repair (BDR) and underwater reconnaissance in potential landing areas. 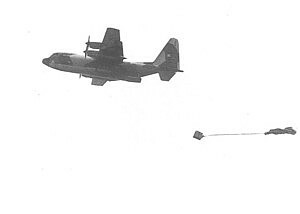 It was also recognised that minesweeping would be required if the Argentinians laid sea mines in critical areas off the coast. To coordinate such operations, MCDO Lt Cdr (later Cdr) Chris MEATYARD was appointed to the staff of Commodore Amphibious Warfare (COMAW – Cdre Michael CLAPP CB, RN). On 5 April 1982, Chris and his small MCM staff embarked in HMS FEARLESS and departed Portsmouth with other elements of the Task Force. Later on, he and his team were transferred to HMS INTREPID but he was soon recalled to FEARLESS because the Commodore needed his specialist advice ‘on tap’. 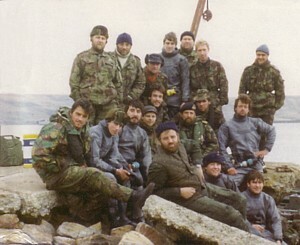 On 25 April 1982, the Argentinean garrison at Grytviken on South Georgia surrendered. The same day, the Argentinean submarine ARA SANTA FE, severely damaged by depth charges from HMS ANTRIM’s Wessex helicopter (Lt (now Rear Admiral) Chris PARRY CBE, son of the late MCDOA member Cdr John PARRY OBE RN), beached herself in Grytviken harbour. MCDO Lt (later Lt Cdr) David 'Doc' O’CONNELL MBE RN, embarked in HMS ENDURANCE, led a five-man team of ships’ divers which spent three weeks clearing hazardous explosives and other materials from the submarine before re-floating her so she could safely be towed out to sea and sunk. He was subsequently appointed an MBE. The elderly Ton class coastal mine countermeasures vessels (MCMVs) in service at the time were unsuited for the long passage and heavy seas expected in the South Atlantic. 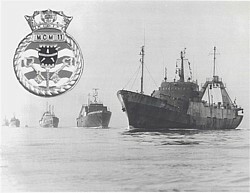 The first two of the new Hunt Class MCMVs were not yet operational so it was decided to requisition five deep sea trawlers from Hull and fit them with rudimentary minesweeping equipment. These vessels were commissioned into the Royal Navy and crewed mostly by the ships' companies of Ton Class MCMVs based at Rosyth: CORDELLA (HMS UPTON); FARNELLA (HMS WOTTON); JUNELLA (HMS BICKINGTON); NORTHELLA (HMS SOBERTON); and PICT (HMS BILDESTON). 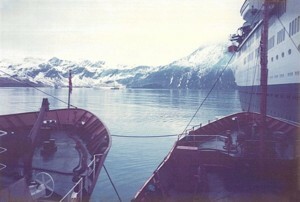 Originally, PICT was to be used solely as a stores ship. However, to minimise loss should ships be lost, stores were distributed evenly among the squadron allowing her to be utiised as a fully-fledged minesweeper too. The group was designated the 11th MCM Squadron and sailed from Portland on 27 April 1982 with MCDO Lt Cdr Martyn HOLLOWAY as Senior Officer in HMS CORDELLA. HMS PICT's conversion delayed her departure such that she joined the squadron on 30 April while 150 miles west of the Portuguese coast. On 11 May 1982 at Ascension Island, FCDT 1 (led by MCDO Lt Cdr Brian DUTTON DSO, QGM, with FCPO(D) Michael 'Mick' FELLOWS MBE, DSC, BEM* as his 2 I/C) and FCDT 3 (led by MCDO Lt (later Lt Cdr) Nigel ‘Bernie’ BRUEN MBE, DSC with CPO(D) Graham ‘Piggy’ TROTTER DSM as his 2 I/C) arrived in an RAF C130 Hercules aircraft to join the Task Force. 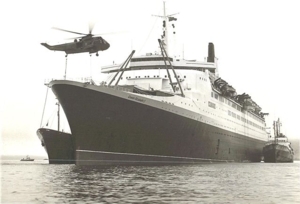 The 11th MCM Squadron arrived at Ascension Island for fuel and met up briefly with FCDT 3 which had planned to embark in the ships but was ordered to passage with RFA SIR BEDIVERE instead. 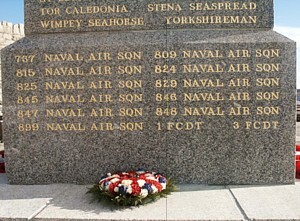 On 13 May, the 11th MCM Squadron sailed from Ascension Island for South Georgia and SIR TRISTRAM and SIR BEDIVERE sailed for the Falklands. Soon after the arrival of Task Force advance elements in San Carlos Water, the clearance divers found themselves in the thick of it. On the afternoon of 21 May, FCPO(D) FELLOWS, LS(D) SEWELL and AB(D) PULLEN of FCDT 1 were called upon to deal with an unexploded Argentinean 1,000 lb bomb in the County Class destroyer HMS ANTRIM. The bomb had passed through the Sea Slug missile magazine and lodged in the heads (toilets). The fuze had been damaged so any attempt to render the bomb safe was useless. While still under air attack and with considerable difficulty, the clearance divers and ship’s staff carefully manoeuvred the bomb through a hole cut in the flight deck and lowered it into deep water. In the meantime, the Type 21 frigate HMS ARDENT was bombed and sunk and the Leander Class frigate HMS ARGONAUT reported two unexploded bombs on board; one forward in the Seacat missile magazine and one aft in the boiler room. As ARGONAUT’s Officer of the Watch, Lt Peter MORGAN RN had already saved the ship once by letting go an anchor to stop her running at full speed towards the shore with her rudders jammed owing to bomb damage. As the Ship’s Diving Officer, he also led his men in surveying and making temporary repairs to the bomb damage in the flooded forward magazine, diving on two occasions in the knowledge that there was an unexploded bomb in the compartment. He was later awarded the DSC. On the morning of 23 May, an Army Royal Engineers team removed the fuze from the bomb in ARGONAUT’s boiler room and it was ditched by the ship’s company. Lt Cdr MEATYARD conducted his own diving survey of ARGONAUT’s flooded Seacat magazine but shortly afterwards, the Type 21 frigate HMS ANTELOPE arrived in the anchorage with two unexploded bombs on board. Tragically, attempts to render these safe by the Royal Engineers bomb disposal team using a rocket-propelled fuze extractor resulted in the death of Staff Sergeant James Prescott (posthumously awarded the Conspicuous Gallantry Medal) and severe injuries to Warrant Officer (later Capt) John Phillips (subsequently awarded the DSC). ANTELOPE was wracked by a series of massive explosions and started to burn from end to end, her lightweight aluminium structure melting in the intense heat. On 24 May, ANTELOPE broke in half and sank after burning throughout the night. RFAs SIR GALAHAD and SIR LANCELOT both reported unexploded bombs on board and Lt Cdr BRUEN carried out surveys of both ships. 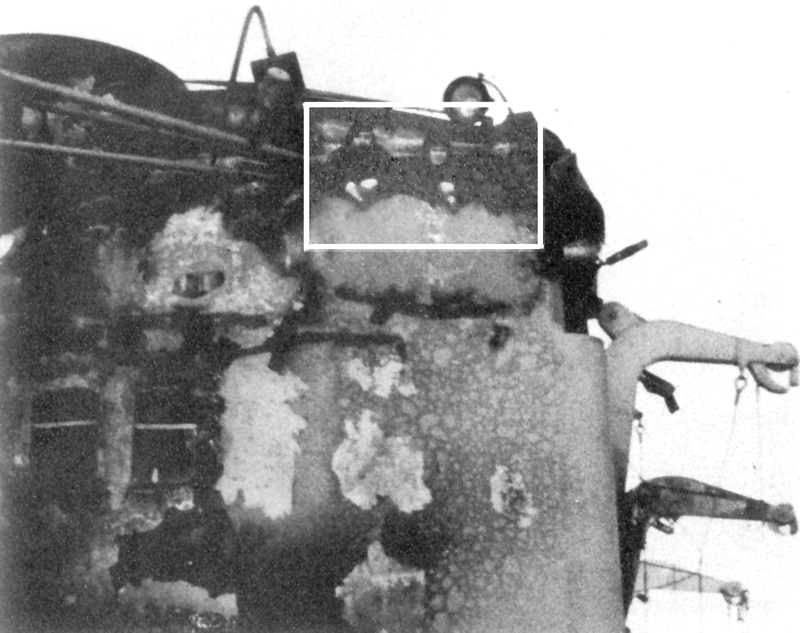 The bomb in SIR GALAHAD had entered her hull on the port side, punched its way through several compartments picking up an aluminium bulkhead on the way, and ended up in her battery charging room wrapped in torn steel and surrounded by smashed carboys of acid. The bomb in SIR LANCELOT had come to rest underneath a companion ladder leading from the recreation space to the officers’ accommodation on the deck above. It was positioned with its nose up at an angle of 45 degrees beneath the lowest treads of the stairs in the ship’s tiny film store. On 26 May, the 11th MCM Squadron arrived at South Georgia and various high value ships such as the QE2 packed with the men of 5 Brigade, vital stores and ammunition began arriving from 28 May. It was vital to transfer these essential supplies for the re-supply of the Falklands into the CANBERRA, NORLAND and the various RFAs that shuttled between South Georgia, the Task Force at sea, and the bridgehead at San Carlos. 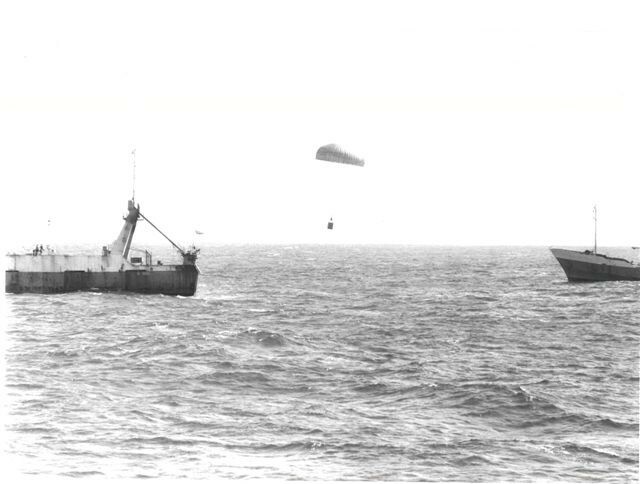 The trawler minesweepers worked tirelessly day after day transferring troops, stores and ammunition in atrocious Antarctic weather with wind speeds in excess of 100 knots, on occasions for several days, before heading on towards the Falklands. Also on 26 May, members of FCDT 1 completed the clearance of ordnance from the vicinity of the bomb in ARGONAUT’s Seacat magazine. This had been patched and pumped out but still required a route to be cut and lifting gear to be fitted before the bomb could be removed safely. FCDT 3 had removed the unexploded bomb from SIR GALAHAD during the night and lowered it into an inflatable Gemini dinghy filled with boxes of corn flakes and two Board of Trade lifejackets; they then towed the Gemini away and sank it in deep water. FCDT3 then commenced clearing the area surrounding the bomb on board SIR LANCELOT, in the meantime moving their belongings from HMS INTREPID to a new shore base at Ajax Bay. During 27 May, progress was made in cutting out two of three access holes for the extracation of ARGONAUT’s remaining unexploded bomb. Repairs to SIR GALAHAD continued while members of FCDT 3 secured and padded the unexploded bomb in SIR LANCELOT. Early on 28 May, Lt Cdr DUTTON (FCDT 1) and his team removed the remaining unexploded bomb from ARGONAUT. FCDT 3 investigated three unexploded bombs in Ajax Bay and countermined one bomb found on the shoreline. They also built a sand bag wall to protect the field hospital from two adjacent unexploded bombs then bivouacked between the blast wall and the hospital to provide reassurance to its patients and staff. Other members of FCDT 3 recommenced clearing access to the unexploded bomb on board SIR LANCELOT. Between 31 May and 2 June, MCDO Lt Cdr Iain 'Bruce' MACKAY RN, accompanied by CPO(MW) 'Bill' HALEY, LS(MW) P C STRIDE and LS(MW) J S CARTER, commanded one of two Landing Craft Vehicles & Personnel (HMS INTREPID’s LCVPs T5 and T6) towing the hurriedly developed Assault Minesweeping System Mk 1 to confirm the Port Salvador approach channel and the length of Teal Inlet were clear of mines prior to amphibious landings. Lt Cdr MACKAY was subsequently awarded a Mention in Despatches. During the night of 4 June, members of FCDT 1 conducted a covert underwater search of Bluff Cove inlet for obstacles or mines that could hazard an amphibious landing. During the night of 10 June, HMS PICT (Lt Cdr David GARWOOD RN), (sister ship of the GAUL that had sunk in unknown circumstances while fishing) was tasked with HMS CORDELLA (Lt Cdr Martyn HOLLOWAY RN) in support to influence sweep Berkeley Sound. Their objective was to clear an area for ships that would provide naval gunfire support for the final stages of the assault on Stanley. HMS PICT was the only ship available that had the special sweep system necessary. Transferring all non-essential crew to HMS CORDELLA at sea at the entrance to Berkeley Sound, HMS PICT began sweeping but the risk increased markedly early in the operation when the influence sweep failed. Clearly PICT was not built as a minesweeper and any breach in the hull would have resulted in the ship's rapid sinking. Undeterred, knowing the importance of the mission, and in the knowledge that the Task Force Commander had accepted the risk of loss of a trawler, HMS PICT's Commanding Officer decided to turn his ship into a guinea pig. HMS PICT was made as noisy as possible by running all machinery at various speeds and revving up the main engine while completing the required number of runs through the area. Fortunately no mines were found, HMS CORDELLA transferred the remaining crew back to HMS PICT and Lt Cdr GARWOOD was subsequently awarded a Mention in Despatches. 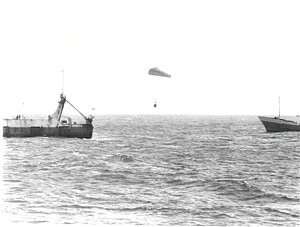 Between 23 June and 4 July, when the weather allowed, the minesweeping trawlers of the 11th MCM Squadron swept the enemy minefields at the entrance to Port Stanley. They bagged 10 of the 21 deadly moored mines laid by the Argentinians, the other mines having broken adrift and floated away or failed to deploy from their sinkers properly. CORDELLA did not sweep any mines as she was always out in front using her sweeps to protect the other ships and hopefully in safe water. PICT, next in line swept three mines. One of these nearly struck NORTHELLA which had to manoeuvre hurriedly to avoid it. 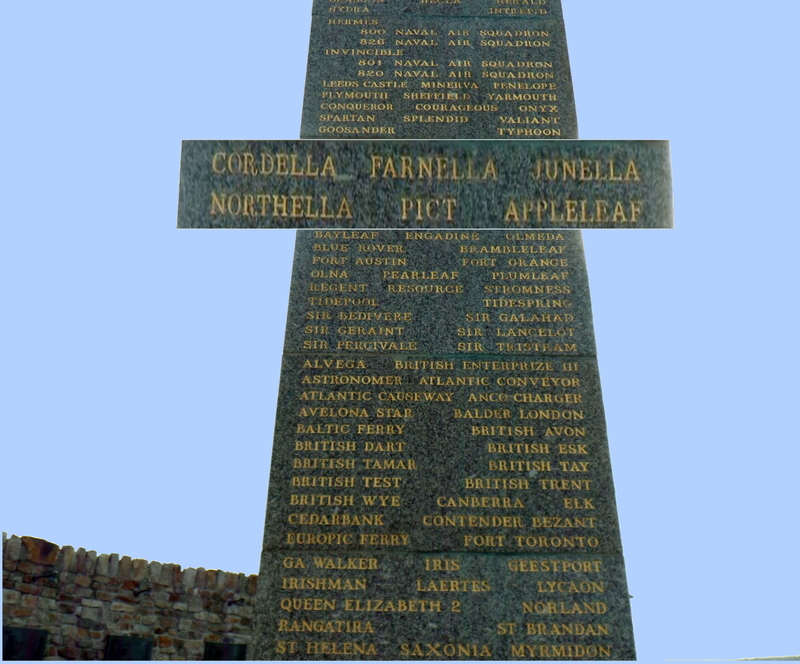 NORTHELLA swept two of her own, JUNELLA four, and FARNELLA one mine. Another of PICT's mines was towed inshore by JUNELLA on 26 June to be made safe by Lt Cdr Bernie BRUEN for shipping back to the UK for analysis. 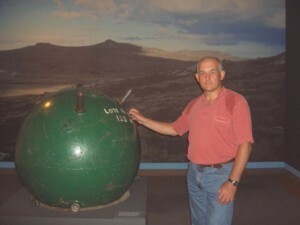 The mine, normally on display in the mining hall of the Minewarfare Training Element at the Maritime Warfare School at HMS Collingwood, was exhibited at the Imperial War Museum as part of the 'Falklands 25' exhibition in 2007. In early July 1982, the Hunt Class minehunters HMS BRECON and HMS LEDBURY arrived in theatre and confirmed by sonar that all poised mines had been cleared. Further utilising their submersibles and divers, the two mine hunters then located and disposed of remaining married mine failures and mine sinkers. 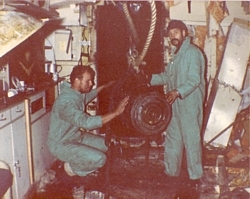 Between 13 October 1982 and 2 January 1983, a Royal Navy saturation diving team led by MCDO Lt Cdr (later Cdr) Mike KOONER RN (CO MV STENA SEASPREAD and OIC Naval Party 2002) recovered sensitive items from the wreck of the Type 42 destroyer HMS COVENTRY, sunk by Argentinean bombs 10 miles north of Pebble Island. At the request of COVENTRY’s Commanding Officer, Captain David HART DYKE LVO, RN, the divers also recovered his ceremonial sword and telescope, now on display in the RN Museum in Portsmouth, and the cross of nails from Coventry Cathedral, presented in 1978 when the ship was commissioned. Lt Cdr KOONER was subsequently appointed an MBE and PO(D) Michael 'Harry' Harrison was awarded the Queen's Gallantry Medal (QGM). Postscript: In August 2007, MCDOA member Brian Dutton sent me photos showing that FCDT 1 and 3 had been added to the units listed on the Falklands Liberation Memorial at Port Stanley. 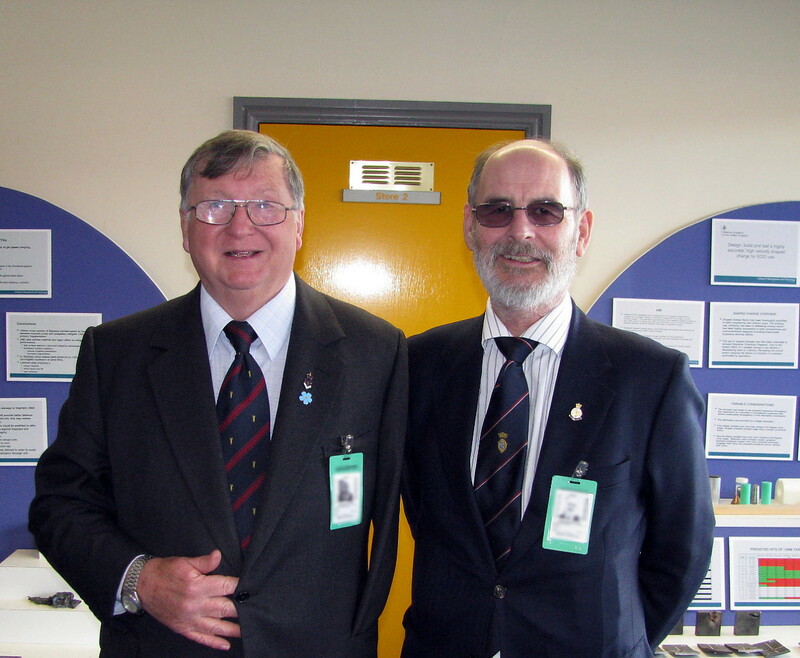 In February 2012, Sukey Cameron MBE, the London representative of the Falkland Islands Government, provided a photo showing the addition of FCDT 2 in 2007/8. Unfortunately, the teams are shown as '1 FCDT', '2 FCDT' and '3 FCDT' instead of 'FCDT 1', 'FCDT 2' and 'FCDT 3' respectively but at least their contributions have now been acknowledged. At long last, it looks as though the record is being set straight. "South Atlantic The qualifying period for the award of the South Atlantic Medal without the Rosette will be extended from 12 July to 21 October 1982. The original decision to end the qualifying period on 12 July 1982 was taken too hastily: those who served beyond that date experienced both risk and rigour until the airfield at Mount Pleasant was completed on 21 October. The qualifying period for the award of the South Atlantic Medal without the Rosette will be extended from 12 July to 21 October 1982. The original decision to end the qualifying period on 12 July 1982 was taken too hastily: those who served beyond that date experienced both risk and rigour until the airfield at Mount Pleasant was completed on 21 October." The islands had been liberated on 14 June but this statement brought into entitlement members of the ships' companies of HMS Brecon (CO & CTU Cdr (later Cdre CBE) Peter Fish RN), HMS Ledbury (MCDOA member Lt Cdr (later Cdr OBE) Tony Rose RN) and the older RMS St Helena who didn't arrive off the Falklands until early July 1982. MCDOA member Dougie MacDonald was the TU's SOO. The qualifying period for the award of the South Atlantic Medal without the Rosette will be extended from 12 July to 21 October 1982, when the airfield at Mount Pleasant was completed. Applications for the South Atlantic Medal, under the new time extension, will be accepted from 1 October 2014 onwards. The awards will begin to be despatched towards the end of that month. Applications will be dealt with in date order.